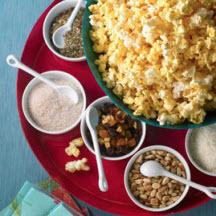 Set up a fun popcorn bar at your next party and invite guests to create their own personal popcorn snack mix. Chocolate chips or candy-covered chocolates, etc. Stovetop Popping: To pop popcorn on a stovetop, cover the bottom of a 3 to 4-quart pan with a thin layer of vegetable oil (don’t use butter, it will burn). Place 3 kernels of popcorn in the pan, cover with a loose lid that allows steam to escape, and heat. When the kernels pop, pour in enough popcorn to cover the bottom of the pan, one kernel deep, cover the pan and shake to evenly spread the oil. When the popping begins to slow to a few seconds apart, remove the pan from the stovetop. The heated oil will still pop the remaining kernels. To Assemble Popcorn Bar: Set out a large bowl of popcorn. Place smaller bowls with various popcorn add-ins around the big bowl of popcorn. Let each person fill a paper bag or other container with popcorn and top or mix with their desired flavorings.